Gadgets, doodads, and technical stuff seems to go hand in hand with some photographers. Sometimes I wonder if photographers are just bicycle freaks who are too unfit to ride. Both groups suffer from GAS – gear acquisition syndrome. The number of times I have seen “wiggle” boxes turn up with scientifically proven performance enhancing cycle gear at work was overwhelming at my last company. Shoes, rims, cranks, pedals, quick release this, fast start that. Whilst not completely in the grips of GAS, I am on a holy quest to find or design the perfect camera bag. What am I looking for? No obvious branding that is relevant to cameras – nobody wants a Nikon bag that paints a target for theives. Not obviously shaped as a camera bag – for the same reason. Easy access to key compartments – I don’t want to have to undo fiddly straps when I need to get at my gear. Flexible interior space – dividers that are not fussy and complicated. Most of the time I take them out anyway. Secure interior pockets for keys, phone etc. Wet weather shroud that pulls out from a hidden compartment. Not too big – having a smaller bag forces you to make better choices on what gear to take out each time. Big bags just encourage a pack horse mentality where you schlep around kilos of gear you are not going to use. Loops to attach a tripod. Removable strap, in case I want to customise. For larger bags, a good even spread of weight. The Domke F2 Classic Bag ticks a few of the boxes, but not all. It is a wonderfully retro styled canvas bag. It is soft, and supple, with a firmer bottom insert in the bag to give it some structure. Domke bags come with a recommended insert to get you started. The one that came with my F2 does not fill the whole bag. It has four compartments, each big enough to fit a lens in. You can fit two larger items such as a 24-70mm 2.8 zoom (which is quite a big lens) and a 35mm body without a lens, and then two smaller items like a flash and smaller lens. To give it a bit more flex, I unpicked the seam of one of the inner compartment walls. The wall is now a moveable flap – which can still separate two items which hold the wall in place anyway, or push it aside to fit an even larger item, like a medium format body. The remaining space outside the insert can be used to fit another body or similar, but is only protected by a thin layer of canvas – no impact protection at all. Another insert or protective bag is a good option here. Unless you love the sound of cracking glass. The two external side pockets are perfect for things you need to access throughout the day. Good sized velcro tabs hold the flaps down adequately. I keep things like flashes, light meter, and film in the side pockets. The latches are an abomination. They are sharp, unyielding, finger hurting monsters. The amount of pressure required to depress the lever to unhook the latch is bordering on Hulkian. They are definitely not “quick release”. There are some velcro patches that could work when things don’t need to be totally secure, except the velcro must actually be “Vilcro” or “Felcro” – a cheap private label imitation which doesn’t deliver. The velcro does not seem to hold the top flap in place. So most of the time, you will be walking around without the top flap secure, so don’t tip the bag over. Even with the latches secure, the combination of no complete seal and the flexible structure of the bag can open up gaps for stuff to fall out of if gravity aligns. I have not had something fall out yet, but have come close once or twice. The bag has no weather proofing either. The canvas will hold off a light sprinkle, but anything more is going to soak through. I keep a shopping bag in the side pocket as an emergency raincoat if I get caught out – but tend to take other bags if it looks a bit grey. OK, so there are few issues. I still love this bag. 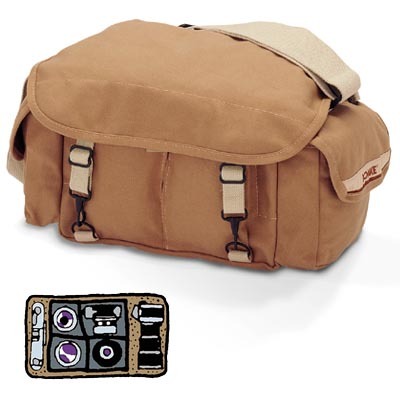 The sandy coloured canvas looks pretty cool and is fairly inconspicuous – it doesn’t look much like a camera bag. The strap is pretty good – soft cotton webbing with rubber sticky grippers woven in to prevent any slippage. . The bag also has an additional small strap that is pretty tight which you can use as a “handle” to pick up the bag by hand anytime. The inside of the bag is a pretty large space, so you can configure it however you you like. There are not too many complex compartments – the more specialised a compartment, the less flexible and therefore more useless it is – unless I have exactly the same gear as the bag designer. This is my “go to” for when I want to take more gear than usual out with me. Now for the best bit. This is the most comfortable larger bag I have ever used. There is an accessory harness that makes you look like a Gallipoli reject, but I always fancied joining the army, so no problems there. This one accessory makes all the difference. It is a bit complicated hitching it on, and can get a bit tangled up when you take it off. It rests your bag on your lower back, depending on how much you let the straps out. This is a suprisingly sensible place. I personally find backpacks uncomfortable and restrictive. Just like a backpack, you can only access the bag contents by taking it completely off. The two straps distribute the weight of the bag evenly, reducing the senstation of being loaded up. I realise I have an irrational attachment to this bag – particularly after re-reading this article.